The writer, artist and colorist talks about her latest project for Native Realities Press, her contributions to ‘Sovereign Traces’ and ‘Deer Woman,’ and much more. 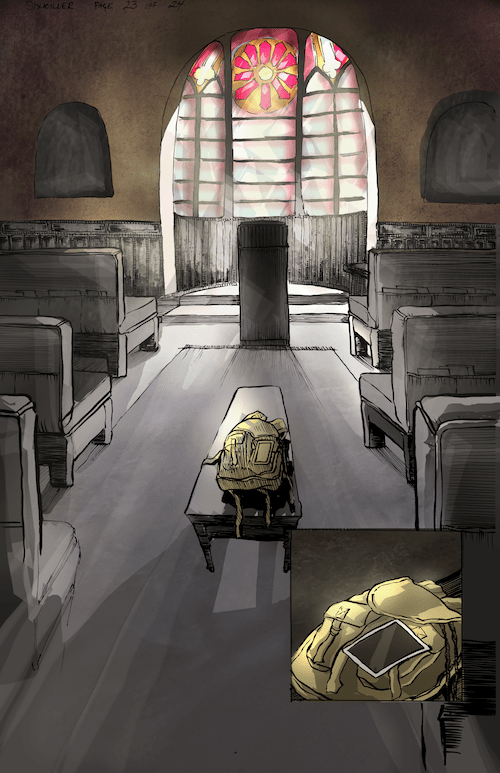 Weshoyot Alvitre has been working in comics for years now as a writer, artist and colorist. She’s drawn covers for Satellite Falling, 10th Muse, and Tribal Force, drawn stories for Once Upon a Time Machine and Tales of the Mighty Code Talkers, and contributed to Little Nemo: Dream Another Dream. She’s colored Tribal Force and the upcoming Scout: Marauder, co-edited and contributed to last year’s acclaimed Deer Woman: An Anthology and has drawn the cover for the upcoming ninth volume of the acclaimed Dirty Diamonds anthology. Michigan State University Press has just published Sovereign Traces Volume 1: Not (Just) (An)Other, which includes a poem by Joy Harjo that Alvitre adapted and illustrated. 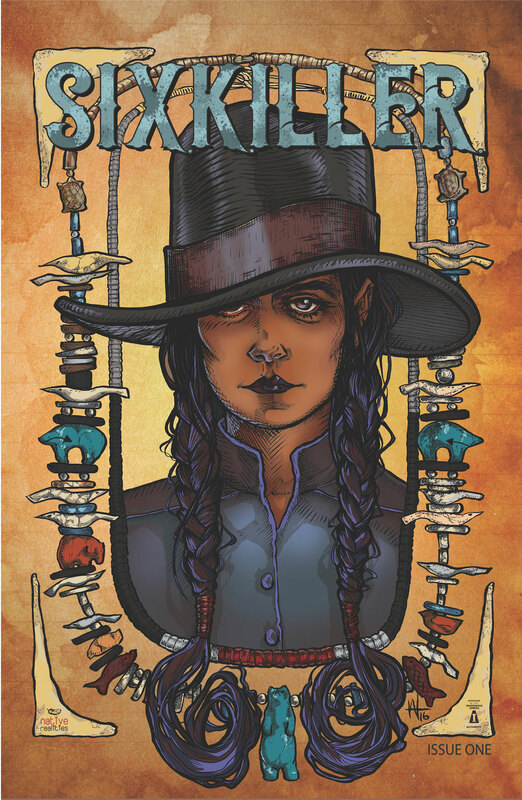 Native Realities Press has also just released Sixkiller #1 by Lee Francis and Alvitre. A new series that Francis described as “Alice in Wonderland meets Kill Bill in Cherokee country,” the book is a stunning writing debut by Francis. The two projects also represent Alvitre’s best work to date, beautifully rendered with dynamic page designs, and make the case that Alvitre is no longer a promising young artist – she’s arrived. Her influences can be seen in her pages, but the result isn’t derivative of anyone and her work is simply stunning. She was kind enough to answer a few questions. I always like to start by asking people, what brought you to comics? I think the ultimate thing that brought me to comics is story. When I was a kid, I loved animation. I loved The Little Mermaid. I was obsessed with that film as it was unlike anything I had seen before. I asked how it was made. The story, the songs, the colors – the animation was just wonderment to me at a young age. Then my mom bought me a small graphic novel adaption of it. They had broken it down, probably using key frames from the animated piece. And in that moment, the breakdown of singular images to tell the same story hit me like a ton of bricks. After that, storytelling through sequential art became my passion. It took me many years to understand how animation worked, how comics worked, etc. but it really spurred my interests and directed them through the first 15-20 years of my life. So what is Sixkiller? What is the book to you? Sixkiller is a bit of a revenge book. It takes place in Indian country, and revolves around the main character Alice, coming to terms with her sister’s murder. It ties in mental health issues, and crosses lines of what’s real and whats on the other side of reality. The book to me is a jumping ground to try some new things with my art style, and also something new in interpreting this setting. When Lee first mentioned this, what made you interested in drawing the book? When he pitched the idea to me, he said it was like Alice in Wonderland meets Kill Bill. I have always been a huge fan of both, and quite honestly, I thought it was rather bold of Lee to describe it that way, as I had sort of pegged him as a safe, superhero style writer. He surprised me with this, I won’t lie. That unexpected boldness combined with the writing skills I knew he had got me very excited about the project. 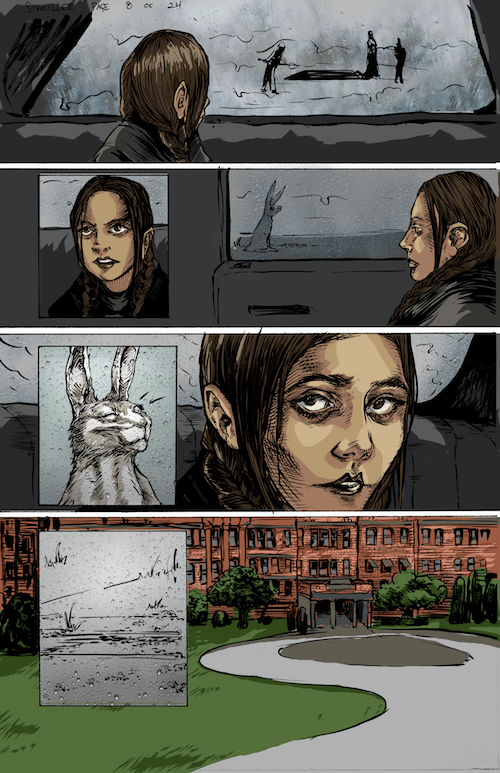 Years ago, while I was in college, I did a few pages of a darker Alice in Wonderland-style story. I still have the pages and have always been a bit fond of them. So having an excuse to dive back into a similar realm was very enticing to me, especially with the overlapping Native elements, like the living fetishes. I have always been a huge fan of the original illustrations of the book done by John Tenniel. They’re detailed and dark, despite them being for a children’s book. I told Lee outright I wanted to try to mimic a bit of that dense inkwork for this book. And from years of studying Victorian Illustration, I felt like if given the time, I might be able to pull it off. How do you and Lee work together? What’s your working relationship like? I think we are both excitable, a bit neurotic, but with common goals in mind. We were both super excited when we initially got this project off the ground, and of course we often are working on multiple projects at once. So this particular book did get pushed back during production. However, I feel like the art and final visuals of the book are some of the best work I personally have put out, and something that I am really proud of to have in the Native Realities library. I love working with Lee as he gives me a lot of freedom to take the book in the direction of my choosing. I appreciate that he trusts me to do that with his writing. And I also feel that he gives some very good editorial feedback during the process and afterwards, so we have really discussed the entire issue and book thoroughly and its something very thought out in the end. I have a lot of respect for his viewpoints and his writing. So I would say its a pretty damn good working relationship. The fact he is flexible with my art style time frame helps matters too. I couldn’t realistically do this style of art on a monthly book, and I appreciate him respecting that, so we have a beautiful product in our hands at the end. How long and how big is this series? That I am not entirely sure. I told him I am in it until the end. It does have an end, but I will leave that up to Lee to answer more thoroughly. Just to turn to another project of yours, for people who don’t know, what is the story of deer woman? The story of Deer Woman, from what I understand, is a solitary figure of oral history and storytelling. The concept of a deer woman appears in many traditional stories. In many, she is a lone creature, luring men, predominately, away from the true paths in life they should be following. She is a reminder of how straying from original teachings (in regards to family, in regards to treating other people, life choices) can be detrimental to your health, your well-being and ultimately, your life. She overlaps many teachings, and I think in that, she is an incredible muse and jumping ground for Indigenous storytelling. 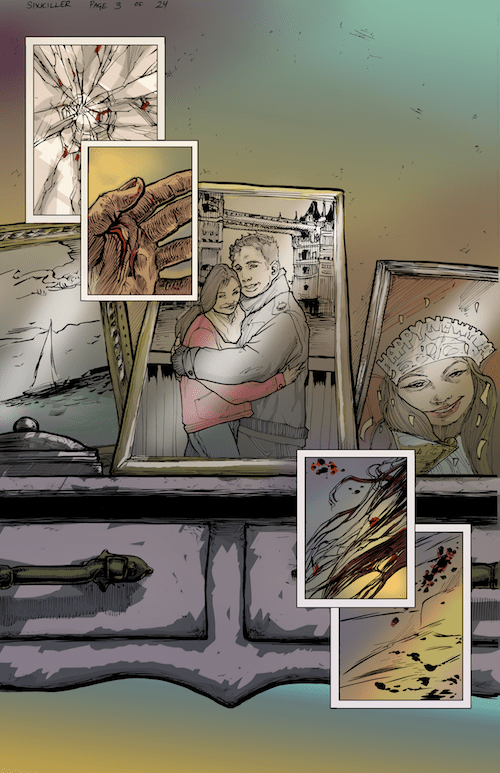 How did you get involved with Deer Woman: An Anthology? I was working with Lee and had met Elizabeth LaPensée through him. He put a call out looking for a co-editor for an unnamed book, and because the assembly, creation of a book from an editorial standpoint really interested me, I threw my hat in the ring. I was in journalism in high school and the behind the scenes work, in regards to organization/page layout/etc. is something I really love. Lee then let me know what the project was, and the fact Elizabeth was heading it, and it just felt like a dream project. What was that process like? How was the work divided between you? I think Elizabeth handled the majority of the workload. I feel like I was there as a shadow, an assistant, to see how she did things, to help give input into the layout, and also into the pieces made for the anthology. 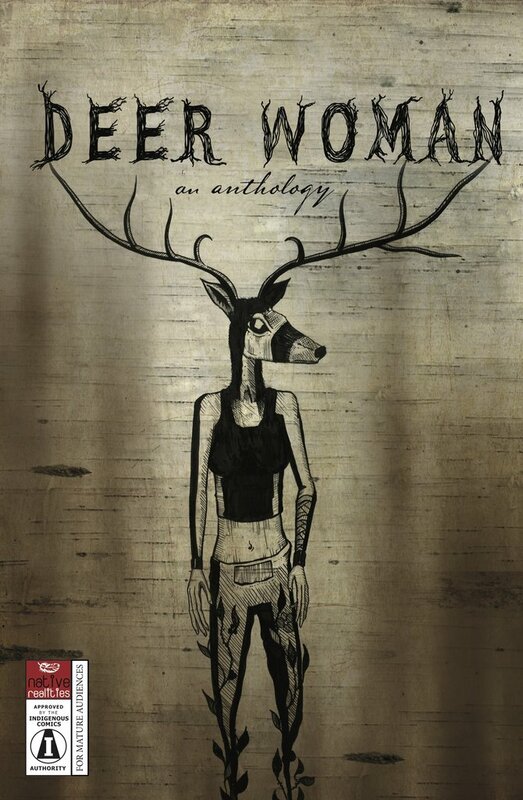 We had a few submissions that felt better suited for another anthology, so there was some editing in regards to choosing art and story that really supported the concept of Deer Woman, but also something that formed reflecting the strength and tenacity of Indigenous women as storytellers and as artists. The organization felt very organic, stories and art would come in, and we would discuss, and absorb each piece. The power in that was that with each finished submission, you could see this amazing energy growing, knowing these stories would all be within a book cover, and that it would be in the hands of more people than just ourselves. It was powerful being a witness to watching it take shape and materialize. Could you talk a little about your contribution to the book? My contribution to the book happened a bit by accident. It was something I created, that needed to be said and put down on paper – but I wasn’t entirely sure through what means it would ultimately be published. Elizabeth felt that it would serve best within this anthology and so I really trusted her. My piece is on Missing and Murdered Indigenous women. It was a piece I did before learning about recent cases, before Wind River, but seemed even more striking after cases like those. I put myself in a dark place. I thought about the cycle of being a woman, through life and death and birth. I thought about unifying blood within, from being native to being human, to how it is a sacred color. There are a lot more things I could write about my piece, my thoughts on it are incredibly dense, and I tried to minimize the words and images, but do so in a way that would hopefully make a strong impact. I sat with it a long time before doing art for it. And I sat with the words for a long time before finally committing the final version. You’re also part of a group show that’s opening in Minneapolis, Bring Her Home: Stolen Daughters of Turtle Island. Yes, I submitted, with approval, the 3 pages of art I did for the Deer Woman anthology to this show. It was hand selected by Angela Two-Stars, whose grandmother was a victim of MMIW and who is also the curator of the show. I was fortunate enough to speak with her on the phone prior to the show opening. Her vision for the work supporting the show is that it presents the issue at hand, but also shows hope, and does not exploit the pain or the issue. I have a lot of respect for what she has done with this show, and the incredible talent she has hanging on the walls. I am honored to have my art within it. 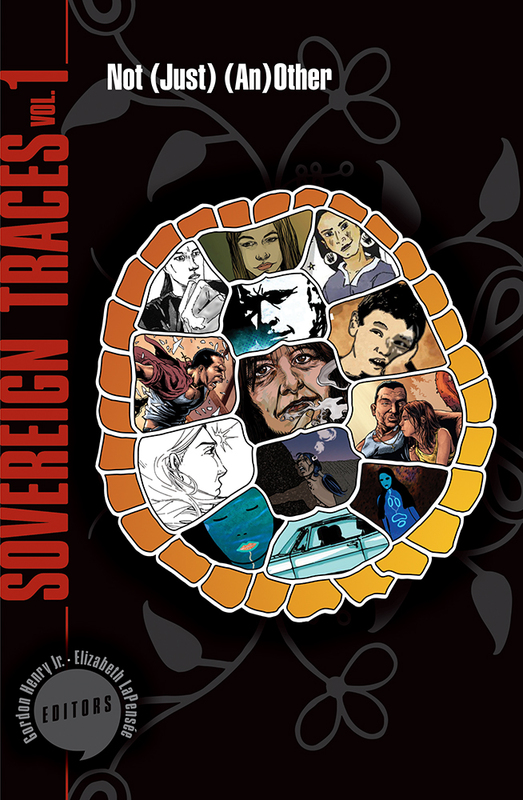 You have a story in Sovereign Traces Volume 1 that just came out. How did you end up adapting and illustrating Joy Harjo’s Deer Dancer? I was asked by Elizabeth LaPensée if I would like to contribute and of course I said yes. She gave me several pieces to read through and to choose from to illustrate. Joy Harjo’s piece spoke to me. I couldn’t get the visuals out of my head and so I told her I wanted that piece. I’m rather embarrassed to admit I was not familiar with her writing. I didn’t take but one Native studies class in college. They just didn’t offer them. But after discovering her voice through this poem, I went on a ravenous Amazon book buying spree and ordered several of her books. The way she writes is something else entirely. Its absolutely inspiring, hits so many feelings I have experienced but perhaps not been able to put words to. She is one amazing woman and I would love to do more art in response to her words in the future. I was honored to have been able to work on this particular poem for Sovereign Traces. I know that you’re working on a few different projects. What are you working on now and what are you thinking about going forward? As always, I have my hat in a few different areas. I am currently working on a children’s book through Penguin, written by Traci Sorell, who is of Cherokee heritage. I am also working on a video game with Elizabeth LaPensée. I am continuing on several projects for Lee Francis and for Native Realities as well. Moving forward, in comics, I really want to lend my art to telling stories which I feel are important in current representation as native peoples. I also want to provide my own personal perspective on historically based material. I didn’t have any Native artists, writers or examples to look up to growing up. Most books about Natives, were not written or illustrated by Native people. So I am doing my small part to try to change that so my children have a different experience with representation when they grow. I find that doing the work I do is very healing for me in many ways. Eventually I would like to do a graphic novel based on my tribe, the Tongva of Los Angeles basis, and to bring light to some of their stories, and people, specifically Toypurina, which is not well known to current people living here in the state of California.